I made these on Saturday. 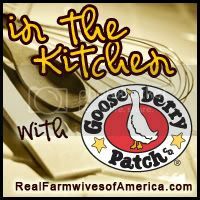 They were Recipe #2 in my Real Farmwives of America and Friends in the Kitchen project with Gooseberry Patch. I'm cooking from Christmas Kitchen cookbook and when I've shared 10 recipes from it, I am giving away a copy right here on my blog! Woo Hoo. I've decided that I gravitate towards recipes with five or less ingredients! Fewer ingredients equal less chance of me making a mistake. These cookies only have 4 ingredients...yes, just 4. I didn't take step-by-step photos because there were only a couple and all of the ingredients were white (well, the butter was light yellow) so photos wouldn't have been too exciting. I actually halved the recipe because I only had two sticks of butter and didn't really want 4 dozen of these melt-in-your-mouth cookies sitting in my kitchen all weekend because I would be compelled to eat all of them. Blend all ingredients together (I sifted the dry ingredients before adding them to the butter); divide into 2 logs. Wrap in wax paper; refrigerate overnight. Slice logs into 1/2-inch thick; cut each slice into quarters (I overlooked this step...oops). Arrange on ungreased baking sheets. Bake at 325 degrees for 18 to 20 minutes. Cool on paper towels. Makes 3 to 4 dozen. I'm not sure how thick the "logs" are supposed to be. I like very specific instructions so this step stressed me out. I'm not sure how to judge the cookies "done." I left them in until they were lightly brown around the edges. I could eat an entire bowl of this cookie dough...I usually have a strict "no eating unbaked cookie dough" rule, but I'm a sucker for butter and powdered sugar...Divine. Despite my concerns about the unknown, the cookies turned out to be delicious. ...and dipped the cookies. Either way the cookies are winners in my book. Definitely going to add them to the list of "cookies to make at Christmas" and they are a great option for a "non-chocolate" cookie. Guess I need to try them. Look simple enough I like refrigerator cookies they are crispy. ACK! I think I said I as making 8 recipes in my blog entry. These cookies look heavenly. I'm "pinning" them for the next cookie occasion! clearly you didn't take the foods project in 4-H because every good first year 4-Her knows to turn the cookie over and look for the dark circle around the edge of the cookie. :) If it's there it considered "over baked" and if not then it's ok. They look great and I love how simple the ingredients are. They look perfect to me! My mom uses a stamp and stamps a cow on the top of each of her cookies. It's fun to add your own twist. These cookies do indeed look wonderful, however, today I June 1, and it is a new day and a new month to take charge of my new "thin" and healthy body. These cookies have sugar and fat, and they are no no's in the healthy weight loss world. Maybe you have other cookie recipes that I would be able to make? Thank You in advance!